In the spirit of the Christmas season, I’m going to be uncharacteristically happy and upbeat today by pointing out that we don’t need perfection to have more prosperity. We don’t even need very good policy to enjoy growth. All that’s really necessary is adequate policy. Just allow the private sector a bit of freedom (I’ve referred to this as giving the economy breathing room) and living standards will improve. We should still strive for perfection, of course, and at least hope for good or very good policy. After all, there’s a big difference in the long run between an economy that grows 5 percent per year versus an economy that grows 3 percent annually, just as there is a big difference over time between an economy 3 percent each year compared to one that grows 1 percent annually. But my main point is that lives all over the world have dramatically improved over time because, on average, we’ve had decent-enough policy. Just consider the United States. We’ve never been a laissez-faire paradise. But there’s been enough economic freedom that, over time, we’ve enjoyed amazing improvements in living standards. And the same is true for the world. I’ve previously shared powerful videos from Deirdre McCloskey and Don Boudreaux that show the world has become much richer over time, and my colleague Marian Tupy has a website, Human Progress, that provides a wealth of data (including a calculator that allows you to see how things have improved since the year you were born). Today, I want to share some very upbeat data from Our World in Data. 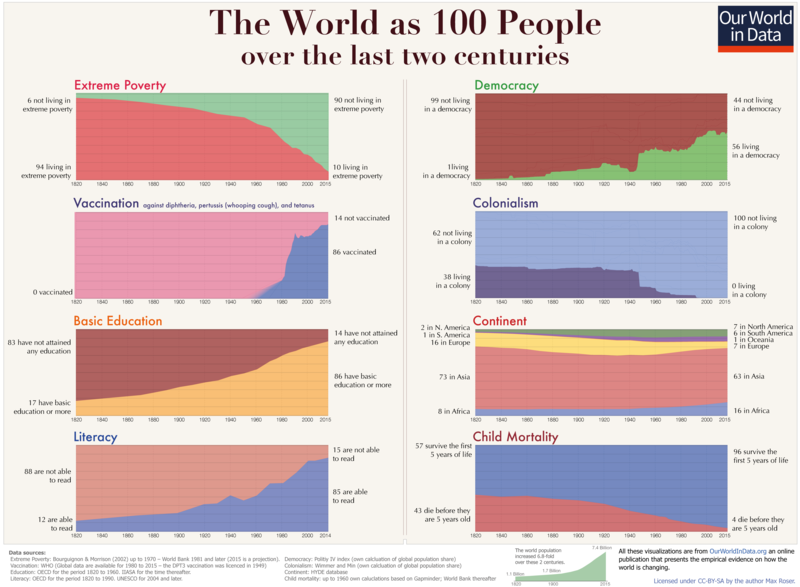 Here’s Max Roser’s cheerful assessment of how life has gotten better over the past 200 years. The reduction is extreme poverty is probably the most important chart, and presumably helps to drive the big improvements in other factors such as literacy, education, and child mortality. And what’s driven the drop in extreme poverty, I would argue, is economic liberty. Not the full explanation, to be sure, but people all over the world generally have more freedom than ever before to engage in voluntary exchange. Yes, the state’s footprint is still far too large. Yes, all nations could grow faster with better policy. But let’s be happy about the fact that even weak growth, over time, can make a meaningful difference in the lives of ordinary people. So cheer up. P.S. I can’t resist adding a depressing footnote. The traditional cost of bad policy is weak growth, which means living standards increase at a much slower pace. But there’s something else happening in the world that we have to add to the mix. The global change in demographics, combined with the tax-and-transfer welfare states that exist in most nations, are a very dangerous recipe. My fear is that we may move from a world where the “traditional cost” of “weak growth” may be replaced by a world with a “new cost” of “macro instability.” In other words, in the absence of reform, more and more countries are going to face Greek-style fiscal and economic chaos. Moreover, the magnitude of the mess will be so large that the International Monetary Fund and other entities won’t be able to provide bailouts (which is how Greece is being propped up).